Your credit card company just wants to be friends. And cardholders are starting to see the benefits. According to a recent survey from Synergistics Research Corp., "Exploring the Changing Credit Card Market," 25 percent of credit card holders say they have become a fan, friend or follower of a credit card brand or issuer. The primary reason people give for connecting with the brand on social media, per the survey, is that it gives them access to special promotions and some of the best credit card deals. The major credit card companies are all getting into the game. American Express, Visa, Discover and MasterCard all have established a presence on Facebook and Twitter. In fact, American Express leads all credit card companies with the most pervasive social media presence, garnering more than 2 million "Likes" on Facebook, nearly 156,000 Twitter followers and more than 2 million views on its YouTube channel. But is social networking with your credit card issuer a smart move? Jennifer Abernethy, author of "The Complete Idiot's Guide to Social Media Marketing," says it could be. "You don't need to [connect], but it's not a bad idea because their card may be offering social specials they may not promote otherwise," says Abernethy. Discover uses social media to draw more traffic to its best credit card deals and latest rewards programs featured on its website. For example, you can get to Discover's website from several places on Facebook, says Suzanne Stull-Lazo, Discover's social media and brand manager. "Through our social efforts, we work to provide more unique opportunities for people to make an impact, engage with our team and other card members, be the first to hear about deals, enter contests, and get valuable information," she says. "Consumers benefit from personalized attention and rewarding experiences and offers." Connecting with credit card companies through social media offers you a way to communicate and engage with your card issuer unlike anything in the past. "The playing field has been leveled," Abernethy says. "You have a direct connection to these big companies. You can build actual relationships with full-time employees that are connected to decision makers within the company." Stull-Lazo also says social media not only helps you establish relationships with credit card companies, but also with other cardholders. "We personally interact with each customer," she says. "Our community is passionate and highly engaged, and fans often share valuable financial tips, information and deals with one another." In addition, social networking can open the door to resolving customer service issues. In a survey of American banking executives who recently attended the 23rd annual Card Forum and Expo, almost two-thirds said their credit card companies already made use of social media to improve customer experiences. 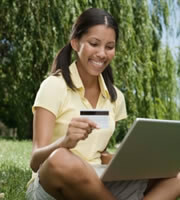 However, social networking is not always the best way to resolve issues with your credit card account. "While we value the conversation and feedback from our participants, we will only address account service concerns through secure channels such as our secure messaging center," Stull-Lazo says. "We are diligent about ensuring the security of our customers' personal information and continue to reinforce with participants that they should never disclose any personal account information in a public forum." Abernethy also cautions consumers to mind their manners when airing their displeasure with credit card companies on social networks. "Don't badmouth these people on these sites," she says. "Remember, everything you do is a reflection of you, so be wary of what you say." In the future, expect more interaction between credit card companies and consumers. Of those participating in the survey at the Card Forum and Expo, 74 percent said they expect social media to be a significant factor in the future of their company's customer service strategy. Abernethy agrees. With the introduction of Google Plus, a social networking project similar to Facebook, she expects to see more cardholders networking with their credit card companies through social media. The growth is not limited to the United States. Renren - China's equivalent of Facebook - has announced a partnership with China Merchants Bank to offer a co-branded Renren CMB credit card that takes advantage of social, location and mobile services that allow credit cardholders to "check in" from their current locations to receive promotional information from the CMB merchant partners located in the vicinity. So what's not to "Like" about your credit card? You can look for some of the best credit card deals through social networking with credit card companies, your "friends" with benefits. 0 Responses to "Your credit cards: "Friends" with benefits"